Where Weimar is, Buchenwald is not far and vice versa. A memorial to a memorial on the 50th anniversary of the liberation of Buchenwald. The first commemoration 50 years ago took place on the Appellplatz (roll call square) in front of a provisional wooden obelisk. With the help of old photographs and the notable forms of old trees, which are still standing outside the camp we identified the site of the first memorial. 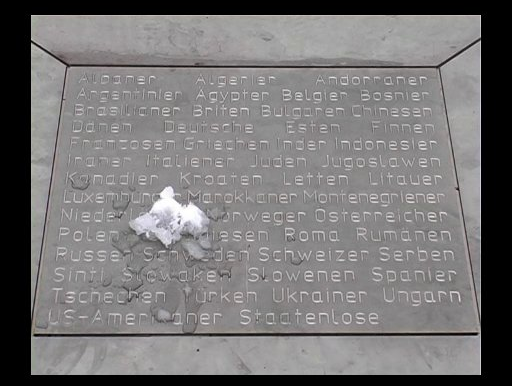 A stainless steel plate bears the ground plan of the obelisk and the names of the nationality groups of the victims. The plate is constantly heated to body temperature of 98.6 degree Fahrenheit (37°C); day and night, summer and winter. The energy for this warm place on the icy cold Appellplatz is donated by the public services of Weimar. Invited by Volkhard Knigge, the director of the Buchenwald Museum, shortly after its postreunification revisions to memorialize the first monument to liberation erected by the camp’s former inmates in April 1945, Hoheisel proposed not a resurrection of the original monument but a »living« alternative. 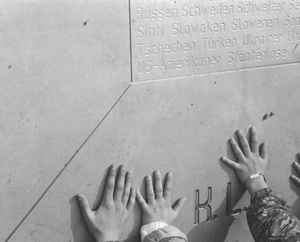 In collaboration with an architect, Andreas Knitz, the artist designed a steel-slab with the names of fifty-one national groups victimized here and engraved with the initials K.L.B., standing for Konzentrationslager Buchenwald, words that had been marked on the prisoners’ original wooden memorial obelisk. 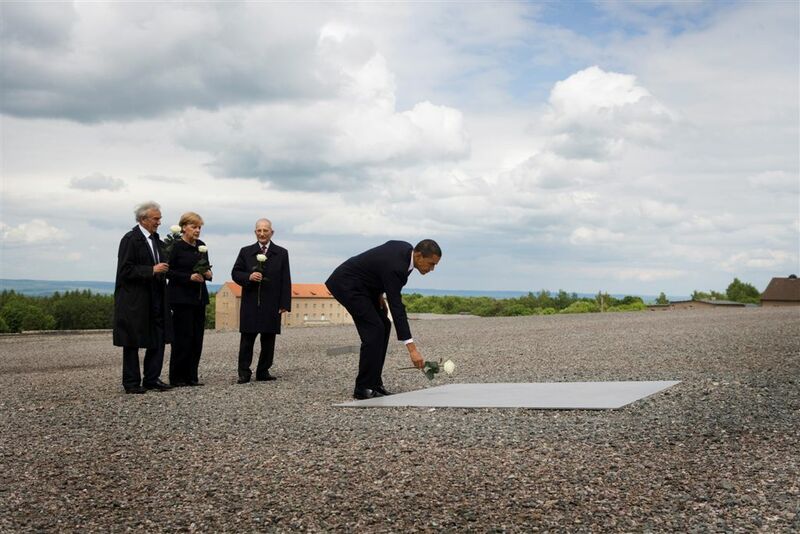 And since that obelisk had been constructed out of pieces of barracks torn down by former inmates - that is, given new life by the prisoners’ own hands – Hoheisel built into his memorial steel-slab a radiant heating system set at a constant 98.6 degrees Fahrenheit, to suggest the body heat of those whose memory it would now enshrine. Visitors almost always kneel to touch the slab, something they would not do if it were cold stone, and are touched in turn by the human warmth embodied there. Dedicated in April 1995, on the fiftieth anniversary of the prisoners’ memorial [which lasted only two months], this warm memorial reminds visitors of the memory of actual victims that has preceded their own, subsequent memory of this time. 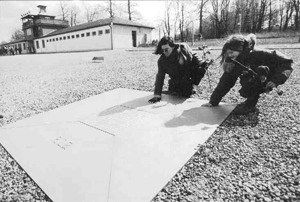 In winter, with snow covering the rest of the ground, this slab is always clear, an all-season marker for the site of the original attempt to commemorate the crimes of Buchenwald. 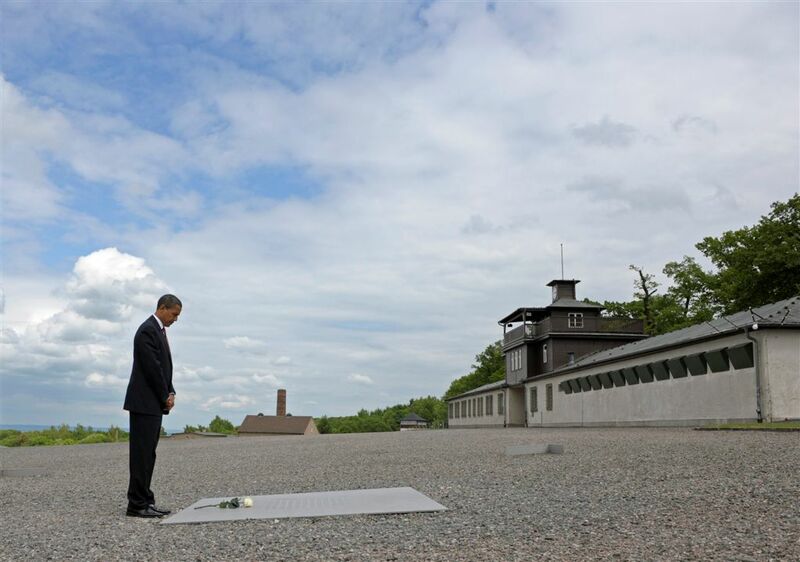 "Chancellor Merkel and I have just finished our tour here at Buchenwald. I want to thank Dr. Volkhard Knigge, who gave an outstanding account of what we were witnessing. I am particularly grateful to be accompanied by my friend Elie Wiesel, as well as Mr. Bertrand Herz, both of whom are survivors of this place. More than half a century later, our grief and our outrage over what happened have not diminished. I will not forget what I've seen here today." 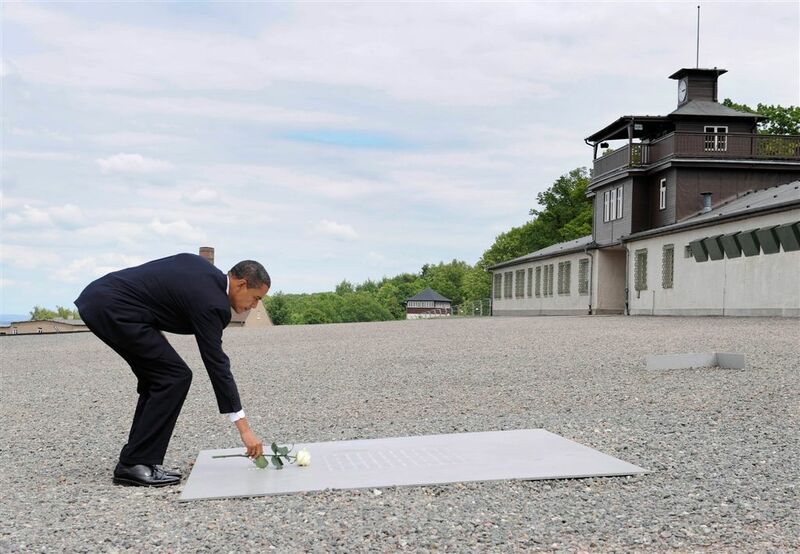 "At the beginning of our joint visit to the Buchenwald memorial the American President and I stood in front of a plaque commemorating all the victims. When you put your hand on the memorial you can feel that it has warmed up -- it is kept at a temperature of 37 degrees, the body temperature of a living human being. This, however, was not a place for living, but a place for dying."